Today I almost finished the skirt of CW and started some on the right hand border. I am so pleased with the progress I have made this month. The skirt will definitly be finished on Wednesday, which is the next time I will pick this one up, YEAH!! 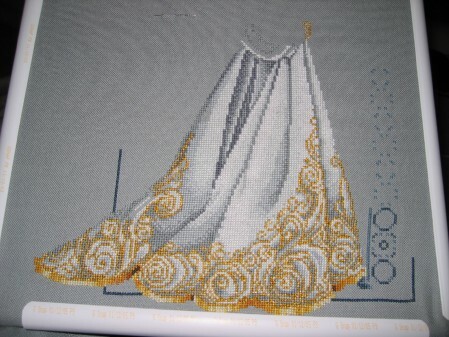 Just a quick post with my latest progress on White Wedding. This is what I have completed as of Thursday night. 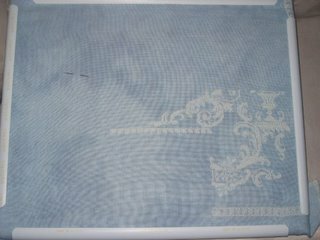 White Wedding is looking beautiful already… what a great fabric for the background of this piece! Great progress on both! That White Wedding piece will be gorgeous on the fabric you picked. They both look great! Hope hubby gets to feeling better. Beautiful! I hope your hubby feels better soon! Great progress on CW, Leslie!